In February 2009, I finally got my Mountain Bike. It’s a 2009 Giant Trance X2. Have been planning to get a mountain bike since last year, but it was just not a priority for me. My friends were actually pushing me to join them in their ride but was not yet ready at that time. I was a biker since the BMX days, have lost one BMX and one mountain bike already. I hope this one doesn’t get lost now. Like a kid who just got his new present, I immediately took a ride in the village to get acquainted with the bike. Had a few laps only as I don’t want to push myself as I have not exercised for a long time. There was a scheduled weekend ride and I was invited to join and was excited as I have been wanting to join them in the trails. Same as running, I haven’t ride a bike for a long time and there was no fitness for me since two years ago. So I told my friend that I might slow down the group, but no worries according to him since they will guide me along the way and adjust to my pace (not really). I got excited the night before the weekend ride, had trouble sleeping again (I mistakenly drank coffee at 5pm that kept me wide awake till 1am). 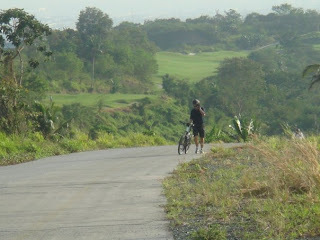 The following morning, woke up 5:30 am, took a shower, geared up, then rode from house to Paseo Sta Rosa (I live near the place) to meet the guys. Off we went to the Cardiac hill. First time I climbed the hill was thru a golf cart (the hill is between the south forbes golf course). Here I was halfway the climb. I ended up walking as I ran out of air. I thought walking would be easy but it was also hard, so I stopped rested for a while and then started to ride until I finish the climb. I have enjoyed the rough trail, especially the downhill, the adrenalin rush was just so amazing. It was a good ride, we finished at 12nn, and boy was I hungry! This would definitely be the start of my weekend ride. From here on, i was motivated to go back to fitness, started jogging at least once a week then ride on saturdays. As i mentioned in my previous blog, the Condura Run made me run more and now i started running on weekdays, and ride on saturdays. Here are the guys, Leo, Luis, Egay, Bay, Ed, and Me..